From Vancouver, British Columbia Mark Winston writes of the precarious condition of the honey bee, and he cautions that the same conditions that have so seriously affected the bees could likewise endanger humans as well. Writing in the New York Times, http://www.nytimes.com/2014/07/15/opinion/bees-and-colony-collapse.html, Winston explains that about a third of the managed honey bee hives worldwide collapse and die each year. Winston is optimistic that by observing the bees we can avoid a similar fate in humankind. The loss of honey bee colonies does not have a singular cause, but instead the deaths result from the complicated relationships between many elements. Winston lists some of these including pesticides applied to agricultural fields and pesticides used in bee hives by beekeepers to control parasitic mites; fungal, bacterial, and viral diseases; nutritional deficiencies caused by monocultural crop planting practices; and commercial beekeeping activities. He explains that the problem arises from the interactions among the many elements which sometimes result in a synergy or multiplying of the harmful effects, resulting in the compromise of the honey bees’ immune systems. Winston explains that the pharmaceuticals that humans use often react in similar synergies as the pesticides injuring bees. He also cautioned that excessive cultivation, chemical use, and habitat destruction threaten the honey bees, pollinators so important for our food production. A Simon Fraser University study conducted on Canadian canola fields illustrates the value of feral bees. Farmers who planted a field earned $27,000 in profit using standard, modern agricultural practices while farmers who left one third of their equivalently sized farm unplanted to provide food and habitat for bees earned $65,000 per year. Modern industrial agriculture designed to optimize crop yields is often stressful on bees and beneficial insects. Beekeepers also may stress their bees through severe honey harvesting or excessive pollination travel. Meanwhile, signs of recovery of species weakened by environmental chemicals and habitat loss exist. 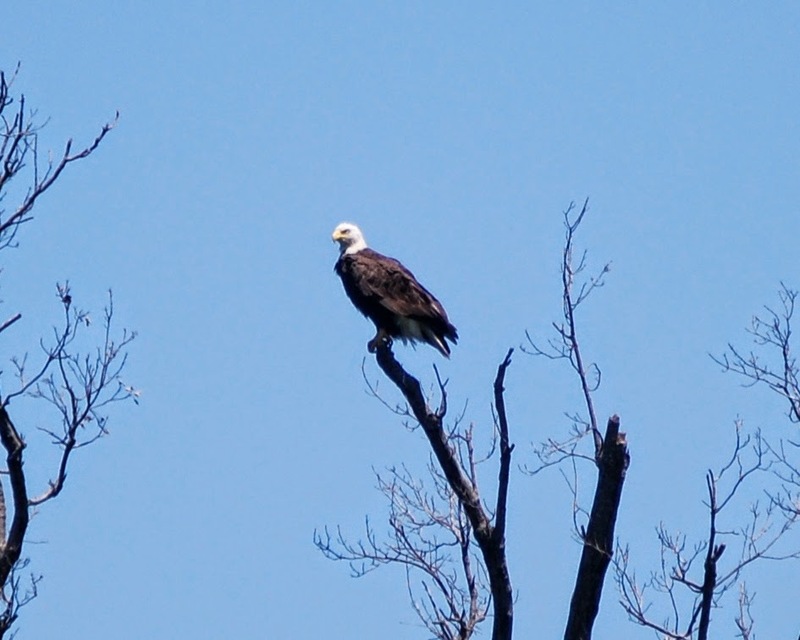 Today’s photo reveals a bald eagle, once rare in the Mid-South, surveying Peace Farm from its lofty perch.